Editorials from Theslowlane: Is road trip tenting on the decline in America? Is road trip tenting on the decline in America? Sure, you can still buy tents at the recreational supply boutique and pay plenty for them. These tents are used along wilderness trails. What about tent camping on a road trip? Alongside the highway? Does the car driving public still use tents? Where does that leave me, as a bicycle tourist? There are still places to camp, but I'm noticing less tent camping. Maybe I'm wrong. Is this just my perception? People who travel by car, on road trips don't use tents anymore. They've graduated to RVs. Yes, the big RVs with satellite dishes and all of that. Energy in short supply? You'd never know it. Seems like more and more campgrounds are for "RVs only." Places that allow tents are still around, government run state parks and so forth, but RVs are taking over. Especially in the private campgrounds. Maybe this has always been the case, but it seems like private campgrounds are often just "RV parks." Camping is getting more expensive and tent camping, even in some state, county and other parks is getting crowded out. They must run all those RVs with plutonium generators. That's the way spacecraft are powered as they sail out to places like Saturn. Places too far from the Sun for solar panels. Radio Thermal Generators. RTGs for short. Just kidding. They do work well in space however. Bicycle touring still relies on tent camping. RTGs for the big screen TV are a bit heavy to carry. I know, many bicycle tourists just "free camp." Don't bother trying to be "legitimate" in campgrounds. Who needs to pay the fee? In regions that are specifically set up for bicycle touring, like that beautiful string of state parks along the California Coast with "hiker / biker" sites, it's great. Camp there for only $3 per night (last I checked). Bicyclists still use tents and some areas subsidize, (basically roll out the red carpet), to encourage bicycle touring. Hard to beat $3 per night in areas where "starter homes" may be in the million dollar range. Energy shortage, recession, mortgage crisis be dammed. Much of America is still in the stratosphere. Do automobile travelers still use tents? 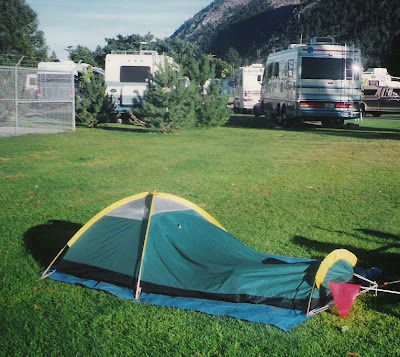 When I was a kid, lots of car campers used tents. Now days, there are the "rent an RV" companies. I don't remember seeing those in my childhood. Now the road's crowded with them. "See America, rent for the week." An innovative idea. One need not own an RV to drive one. It must not be too expensive as the average American gets so little vacation anyway. A week or two of RV rental can't be too much. So, I'm still the "odd ball" doing bicycle touring. Camping by tent, but I find myself staying in motels more often than in years past. Am I getting old or becoming a flabby yuppie? Motels are tempting when sleeping on the ground can cost around $20 while a small town motel might just be $38. One doesn't even have to pitch a tent and yes, it is fun to watch TV. Maybe this is nothing new. In 1993, I found a place in North Dakota where it cost $7 to pitch a tent and only $10 for a basement motel room. That room was a bargain.